MISSION: IMPOSSIBLE FALLOUT. (DVD Artwork). ©Paramount. The global hit “Mission: Impossible—Fallout” arrives on 4K Ultra HD, Blu-ray and DVD Tuesday Dec. 4, from Paramount Home Media Distribution. 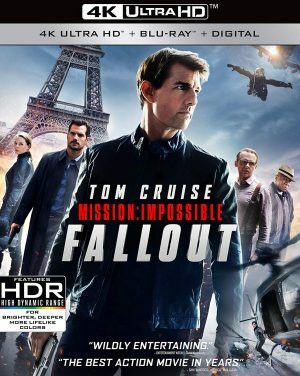 The exhilarating, action-packed movie will also be available as part of the “Mission Impossible” six-movie Blu-ray and 4K Ultra HD + Blu-ray Collection, just in time for gift-giving during the holidays. Produced by Tom Cruise and Bad Robot, Paramount Pictures and Skydance present the action film starring Cruise in his iconic role as spy Ethan Hunt. Now fans can go deeper into the “Mission” with over an hour of high-octane, behind-the-scenes footage highlighting the incredible stunts, heart-pounding action and exotic locations on Digital, a three-disc 4K Ultra HD Combo Pack or a three-disc Blu-ray Combo Pack. Drop from the sky, race through Paris, and cling to a cliff with the intrepid spy as the cast and crew reveal the incredible work that went into creating the breathtaking action. Plus, check out deleted scenes, storyboards, multiple commentaries, and much more. The 4K Ultra HD disc and 4K Ultra HD Digital release feature Dolby Vision, which brings entertainment to life through ultra-vivid picture quality with spectacular colors, highlights that are up to 40 times brighter, and blacks that are 10 times darker. The film also boasts a Dolby Atmos soundtrack remixed specifically for the home to place and move audio anywhere in the room, including overhead. In addition, both the 4K Ultra HD and Blu-ray Combo Packs include access to a Digital copy of the film. 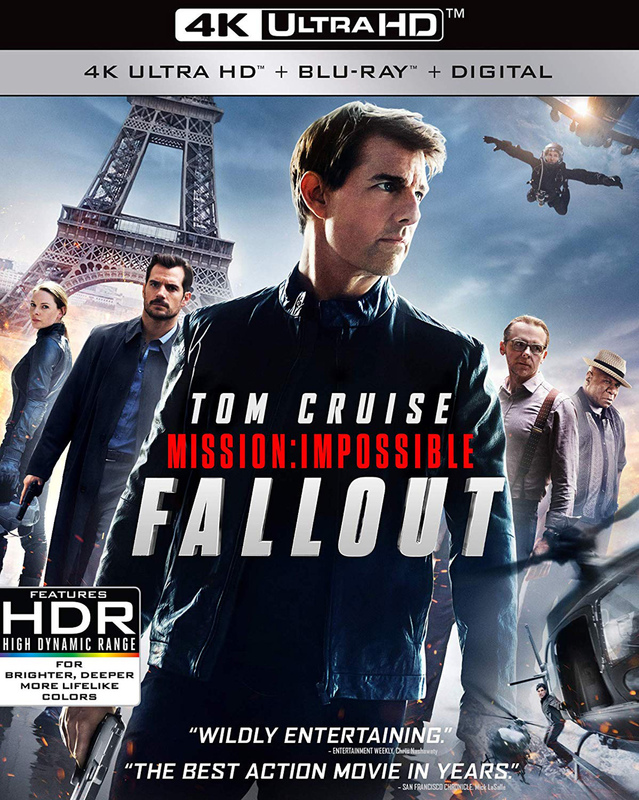 On a dangerous assignment to recover stolen plutonium, Ethan Hunt (Cruise) chooses to save his friends over the mission, allowing it to fall into the hands of a deadly network of highly skilled operatives intent on destroying civilization. Now, with the world at risk, Ethan and his IMF team (Simon Pegg, Ving Rhames, Rebecca Ferguson) are forced to work with a hard-hitting CIA agent (Henry Cavill) as they race against time to stop the nuclear threat. Written and directed by Christopher McQuarrie, “Mission Impossible—Fallout” also stars Sean Harris, Angela Bassett, Michelle Monaghan and Alec Baldwin. The film also is available on Digital. “Operation Finale,” the true story of an Israeli intelligence agent who brought Hitler’s deadliest lieutenant to justice, arrives on DVD, Blu-ray combo pack and On Demand Tuesday Dec. 4, from MGM and Universal Pictures Home Entertainment. The film also is available on Digital. Starring Golden Globe winner Oscar Isaac (“Ex Machina”) and Academy Award winner Ben Kingsley (“Gandhi,” “Schindler’s List”), the historic drama recounts the story of a 1960 covert mission by legendary Israeli intelligence agent Peter Malkin (Isaac) who travels to Argentina to find and capture Adolf Eichmann (Kingsley), the Nazi officer who masterminded the plans that sent million of innocent Jews to their deaths in concentration camps during World War II, and brings him to justice. The film also stars Melanie Laurent (“Inglorious Basterds”), Lior Roz (“Fanda”), Nick Kroll (“Loving”), Haley Lu Richardson (“The Edge of Seventeen”), Joe Alwyn (“Billy Lynn’s Long Halftime Walk”), Pepe Rapazote (“Narcos”) and Greta Scacchi (“Brideshead Revisted”). The drama is directed by Chris Weitz from a screenplay by Matthew Orton. Both the Blu-ray and DVD editions come with a special bonus featurette that takes viewers deep into the remarkable covert operation that rewrote history and includes a commentary by director Weitz. Regina Hall (“Girls Trip”) stars in the heartwarming workplace comedy “Support the Girls,” arriving on Blu-ray, DVD and Digital HD Tuesday Dec. 4, from Magnolia Home Entertainment. Lisa (Hall) is the last person you’d expect to find in a highway-side “sports bar with curves,” but as general manager at Double Whammies, she’s come to love the place and its customers. An instinctive den mother, she nurtures and protects her ‘girls’ on the staff fiercely—but over the course of one trying day, her optimism is battered from every direction. Double Whammies sells a big, weird American fantasy, but what happens when reality pokes a bunch of holes in it? The suggested retail price (SRP) of the Blu-ray is $29.98 and the SRP for the DVD is $26.98 (SRP). RLJE Films will release the ride-sharing thriller, “Ride” on DVD and Blu-ray Tuesday Dec. 4. “Ride” features an all-star cast including actress Bella Thorne (“The Duff,” “The Babysitter”), Jessie T. Usher (“Independence Day: Resurgence,” “Almost Christmas”) and Will Brill (“The Marvelous Mrs. Maisel,” “The OA”). The thriller marks the feature film debut from writer/director Jeremy Ungar (“Soy Cubana,” “Sleepers of the City”). A struggling actor by day, James (Usher) pays his bills by driving people around Los Angeles for a ride sharing service. His night starts out like any other, but he can’t believe his luck when he picks up the beautiful Jessica (Thorne), and they immediately hit it off. His next fare, the fast-talking Bruno (Brill), convinces James to go back and invite her to join them for a wild night out. But things take a shocking turn when Bruno, armed with a gun and a twisted idea of fun, forces them on a terrifying, white-knuckle ride that quickly spirals out of control. The bonus feature on the “Ride” DVD and Blu-ray include the original “Ride” short film. The DVD is available for $29.96 (SRP) and the Blu-ray is available for $29.97 (SRP). RLJE Films will release the horror film “All the Creatures Were Stirring” on DVD, On Demand and Digital Video Tuesday Dec. 4. Co-written and co-directed by David Ian McKendry (“The Dump”) and Rebekah McKendry (“The Barista”), who is known for her work at Fangoria and Blumhouse, “All the Creatures Were Stirring” stars Constance Wu (“Crazy Rich Asians,” “Fresh Off the Boat”), Amanda Fuller (“Orange is the New Black”), Jonathan Kite (“2 Broke Girls”), Jocelin Donahue (“Insidious: Chapter 2”) and Graham Skipper (“The Mind’s Eye:). The horror movie will be available on DVD for an SRP of $27.97. The joyful spirit of the holidays is about to take one dark turn after another. From sadistic office parties and last-minute shopping nightmares, to vengeful stalkers and immortal demons, there’s plenty out there to keep you from getting out of bed to see what’s under the tree this holiday season. The DVD includes a bonus filmmaker commentary. New Line Cinema’s horror thriller “The Nun” arrives on Blu-ray Combo Pack, DVD and Digital Tuesday Dec. 4. It explores another dark corner of the “Conjuring” universe, whose record-setting films have terrified audiences around the globe. “The Nun” stars Oscar-nominated Demian Bichir (“A Better Life”) as Father Burke, Taissa Farmiga (TV’s “American Horror Story”) as Sister Irene, and Jonas Bloquet (“Elle”) as local villager Frenchie. The cast also includes Charlotte Hope (“Game of Thrones”) as the abbey’s Sister Victoria, Ingrid Bisu (“Toni Erdmann”) as Sister Oana and Bonnie Aarons, reprising her “Conjuring 2” role as the title character. Corin Hardy (“The Hallow”) directed “The Nun” from a screenplay by Gary Dauberman (“IT”) and story by James Wan and Dauberman, which delves into the shocking origin of the demonic Nun Valak, who first made her evil presence known in “The Conjuring 2.” “The Nun” was produced by Wan and Peter Safran. 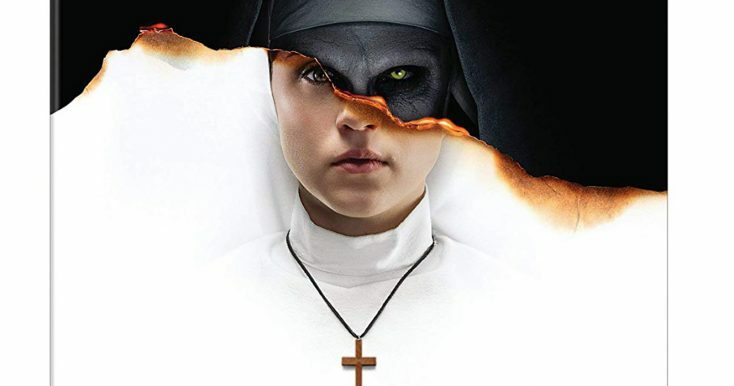 “The Nun” will be available on Blu-ray Combo Pack for $35.99 (SRP) and DVD for $28.98 (SRP). The Blu-Ray Combo Pack includes a Blu-ray disc with the film in high definition, a DVD with the film in standard definition and a digital version of the movie. “The Nun” will also be available on Movies Anywhere. Using the free Movies Anywhere app and website, consumers can access all their eligible movies by connecting their Movies Anywhere account with their participating digital retailer accounts. Fans can also own “The Nun” now via purchase from digital retailers. Oscar winner Kevin Costner (“Dances with Wolves”) leads a sensational cast in writer/director Taylor Sheridan’s engrossing family drama “Yellowstone: Season One,” arriving on Blu-ray and DVD Tuesday Dec. 4, from Paramount Home Media Distribution. The “Yellowstone: Season One” three-disc Blu-ray or four-disc DVD set includes all 10 hour-long episodes from the inaugural season, plus more than 80 minutes of behind-the-scenes featurettes, including an all-new exclusive interview with Costner and Sheridan. “Yellowstone” chronicles the Dutton family, led by John Dutton (Costner), who controls the largest contiguous cattle ranch in the U.S. Amid shifting alliances, unsolved murders, open wounds, and hard-earned respect—the ranch is in constant conflict with those it borders—an expanding town, an Indian reservation, and America’s first national park. The impressive cast also includes Wes Bentley, Kelly Reilly, Luke Grimes, Cole Hauser, Kelsey Asbille, Danny Huston, Gil Birmingham, Brecken Merrill, Jefferson White and more. A closer look at the special effects, music and “character spots” are part of the DVD/Blu-ray extras. Urban Movie Channel and RLJ Entertainment will release Season 1 of the UMC Original Series “Bronx Siu” on DVD Tuesday Dec. 4. The eight-episode first season of the popular police drama, starring Brian White (“Scandal”, “Ray Donovan”), Shanti Lowry (“The Game”) and Leticia Jimenez (“The Fosters”), quickly became one of the channel’s most watched TV series after it premiered on the channel in July. UMC and RLJ Entertainment will release “Bronx Siu” on DVD for $24.98 (SRP). The series follows the pursuits of homicide detective, Jimmy Blue (White). Jimmy suffers from post-traumatic stress disorder and after a string of appalling homicides cause outrage in the city, Jimmy is commissioned to head up an elite unit of investigators tasked with solving the most heinous crimes. Special features on the DVD include cast and crew interviews.